Wow, November flew by! Since I started posting my blog stats monthly, fellow bloggers and readers seem to enjoy the updates, so here’s the latest in my usual format – blogging and then my other various side gigs. Traffic is still of a bit since the October Google Panda update, but it’s been slowly recovering. 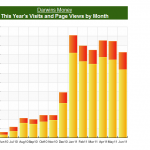 Most of my traffic comes from organic search (which is the most profitable type! ), but it also demonstrates the vulnerability of being so reliant upon mother Google’s teet. Overall on the month, I had a little over 20,000 views total. I could blame Thanksgiving, the weather, Herman Cain’s sunglasses (who the hell gives a press conference in sunglasses?) or whatever, but bottom line is I don’t do enough to network and promote my stuff in the social networks and need to stop being lazy and relying on people just coming to me. I can write the best stuff in the world (which I clearly don’t), but if the search engines aren’t putting it on the front page, it doesn’t get the audience it deserve. But hey, for all you regular readers who keep coming back… THANKS!!! So, overall, this site drove about $2,000 for the month which matches last month’s numbers in aggregate. My Adsense income is down because some of my highest yielding pages have dropped off a bit. Affiliate income is hit or miss and apparently there was a track issue with Flexoffers (my favorite affiliate income outfit!) last month, so my numbers may jump when settled up this month. Direct Ad Placements jumped nicely on both some renewals, plus my new ad campaign manager Crystal (check her out!) drove a couple deals as well. I don’t have much time for freelance these days, so that’s starting to dwindle, but some income is recurring from SeekingAlpha premium articles I wrote (albeit quite small). I make a bit at some other sites I run as well, but this site is my primary online income driver. I don’t have the time to promote my other stuff as much as I’d like, but if you’re interested in investing topics, check out my sites dedicated solely to ETF Investing and High Yield Investing. I’ve previously laid out all the financials and excitement over the college real estate deal I closed in September. Things were going along pretty well until the unexpected happened. No, not tenant damage or repairs. A call from the insurance company – who would have known? That could cause major trouble for us, so we’re scrambling to satisfy all requirements that SHOULD have been known to us BEFORE closing – watch out! The quarterly checks are rolling in which is nice and given the college situation (with parents paying), as well as joint and several leases, we don’t have to worry about deadbeat renters so much, like residential real estate. It’s just the unexpected! I’ve been talking about this one for a while CAD Services sourcing. The business model is great, our web presence continues to improve and we’re broadening our client base which is really exciting. Early on, we’d been heavily reliant on just one or two primary clients with a bunch of $100 jobs coming in which often aren’t worth the time and effort to close and collect. However, this month, we’re starting to get some test jobs for larger, recurring clients which is quite exciting! We’re not raking in the dough, we’re rolling any profits back into expanded advertising, site changes, business system fees, etc., but as long as our revenues keep expanding each month, hopefully by mid-2012, it will be a nice recurring side-income! Very impressive traffic and earning numbers. This is complete BS. I googled “teet” and this is what it gives me? Hilarious; I like to throw that one in there once in a while! 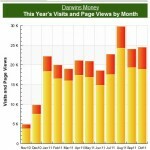 Looks like you had a great month in november, keep it up darwin! Looks great as usual. I’m always impressed with your adsense earning. Great numbers! I’ve been a little upset with FlexOffers lately though. It seems as if they are terminating all of my profitable affiliate programs. Oh that stinks; which programs are they doing away with? Impressive traffic numbers, Darwin. Fifteen bucks an hour is a great rate for drafting services. 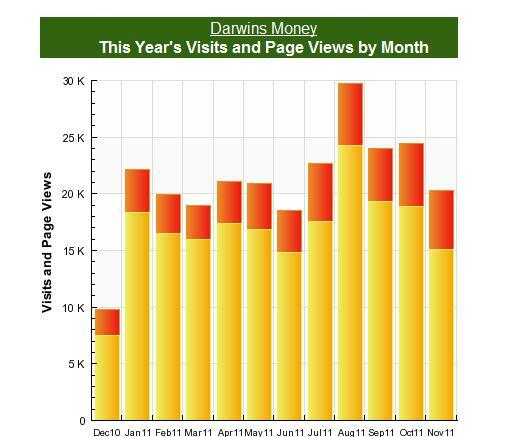 Great numbers, Darwin! Your Adsense numbers are very good.